Did I really want to spend the first sunny day of spring in a dark basement studying demonology? That was the question I was asking myself before Seriously Possessed at Goldsmith’s College, London, on Saturday. Maybe if I wasn’t a blogging witch, I would have found something to do outdoors instead, but I certainly wasn’t the only person at the ASSAP conference on demonic possession – in fact the lecture theatre was packed despite being gloomy and windowless. ASSAP stands for the Association for the Scientific Study of Anomalous Phenomena. What I like about all the ASSAP events I’ve been to is that the speakers and the audiences have a wide variety of views about whether the supernatural exists or whether strange events all have non-supernatural explanations. What I like more, is that all these people are not only happy to listen to each others’ views, but also respect them. That seems better than the average conversation with supposed friends on Facebook. 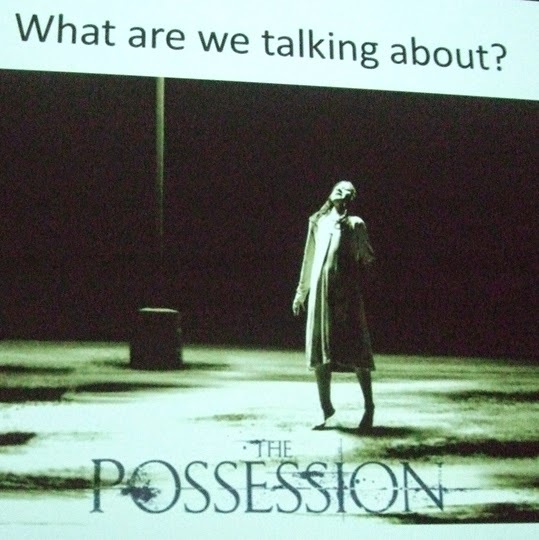 The first talk was a scientific one by Professor Chris French, head of the Anomalistic Psychology Research Unit at Goldsmiths, on The Psychology of Possession and Exorcism. He went into various neurological and psychological conditions - including epilepsy, schizophrenia, Tourette’s and alien hand syndrome - that can be behind cases of suspected demonic possession. In complete contrast, the second speaker was an occultist who, as well speaking about the Goetia, or the Lesser Key of Solomon, gave a practical demonstration of ceremonial magic to banish a demon and trap it in a jam jar (the necessary stuff for that is in the picture at the top). 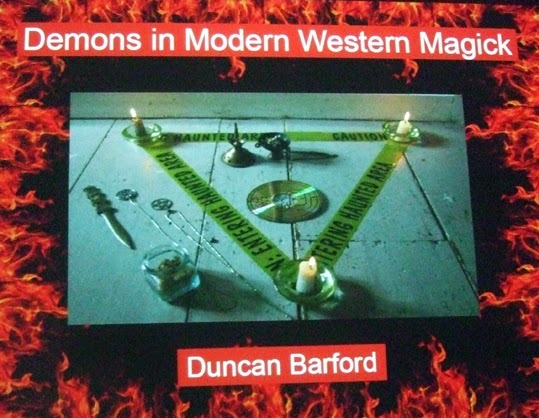 Duncan Barford, author of Occult Experiments in the Home, called his talk Demonic Experience and Rituals in Modern Western Magick. It was my favourite lecture of the day, which is why I’m going to blog most about it. 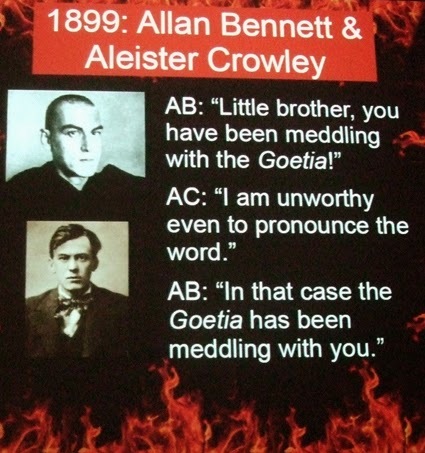 Although I knew about the Goetia, I had never read it let alone tried out any of its rituals. The kind of magic I do as a witch doesn’t normally involve demons, which is what the Goetia is all about. The most common edition was edited by Aleister Crowley. Goetia means ‘howling’ or ‘wailing’ in Greek. Most of it is a dictionary of spirits or demons that King Solomon supposedly trapped in a bronze vessel. The grimoire teaches how to contact those entities and explains what each of them can offer you. Crowley, in his early days, spent a lot of time using the Goetia, but in the end said summoning up demons was a redundant activity. In fact, at the start of his edition of the Goetia, he included The Abramelin Working, which is a ritual to know the true self; to get beyond desire. Duncan said the trap in the Goetia is the temptation to keep returning to it, to summon up more demons to get you more stuff. It is easy to be enslaved by your own desires. As he said that, I got a mental image of The Devil in the Robin Wood Tarot, although Duncan didn’t mention tarot in his talk. I don’t think you need to be a ceremonial magician with the Goetia to feel that kind of entrapment. Modern consumer society gives us plenty of temptation to believe what we really desire is material possessions, and to work long hours in a soul-destroying job to get those material possessions, but to still find we aren’t really happy. Talking about happiness, Duncan also gave an argument in favour of religious and magical practices – they empower us to define our own truth and also to make us happy. Apparently studies have shown that religious people are happier than atheists. He pointed out that even if it is self-delusion, it could be rational to be irrational if you enjoy being happy. The rest of the day offered more variety of views on demons and exorcists. Dr Ciaran O’Keeffe asked Are Skeptics and Exorcists both wrong? He looked at some rare medical conditions that could appear to be cases of demonic possession, and which needed early diagnosis and the proper treatment to be cured. Sociologist Amanda Twist looked at Beliefs in Possession and talked about some demon-related information requests she had dealt with in her role as deputy director of Inform, a non-profit information centre specialising in minority religious movements and spiritualities. Then, medium and exorcist Susan Leybourne entertained the audience with tales of First-Hand Experiences of Exorcisms and Spirit Possession. She described a documentary she claimed managed to film a demonic entity leaving a body – although sadly she didn’t have that clip available to show us at the conference. 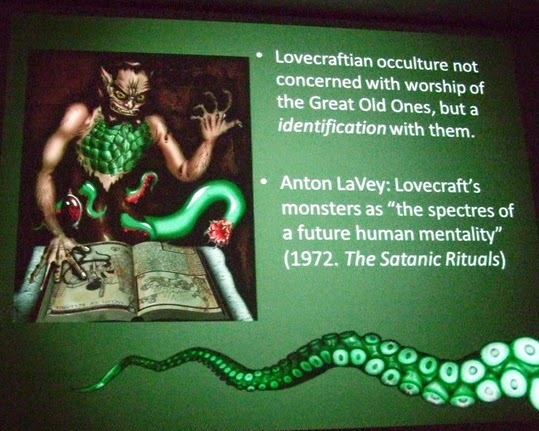 In the early evening we heard about The Demons of Modernity: Possession and the Cthulhu Mythos in Contemporary Culture, in a talk by anthropologist Justin Woodman. As I’ve mentioned before on my blog, I am a fan of HP Lovecraft's horror stories, but have never grasped why anyone would want to invoke the Great Old Ones. Nevertheless, chaos magicians at one time were really into that kind of thing. Justin talked about a group called the Haunters of the Dark who did just that. He himself joined the group and took part in their rituals, which he said involved the usual techniques for invocation including drumming and dancing. He said the group saw the fictional monstrosities as “phenomenological masks” – ways of perceiving aspects of the consciousness and the universe. He said they were tools that acted as symbols of secular horror. At the end of Justin’s talk, I asked the question whether trying to invoke Cthulhu and its ilk was just an experiment in thrill-seeking. Even after his talk I struggle to see why anyone would want to do it for any other reason. The last talk was by historian Jon Kaneko-James. It was called Witches, Possession and Papists and looked at the historical documentation around the case of possession behind the movie The Exorcist as well as earlier cases. It is fascinating to see how accounts of demonic possessions persist throughout history and how modern stories can be similar to those we find in documents from the 16th and 17th centuries. Seriously social ended the event with a chance to chat in the very reasonably priced student bar about all the fun we had had with demons during the day. I'm now looking forward to the next ASSAP conference, which is likely to be either about fairies or witches. Nice review of a really interesting day. Good to meet you, too. Thanks for the write up, I'm glad you enjoyed my talk! Susan, You said you had been contacted by the company to ask to film you. Perhaps if you use those contact details to ask them for a clip they would send it to you or let you know where it can be viewed online? At least the name of the documentary would be great and would allow people to search online for details of it. I'd love to see it.